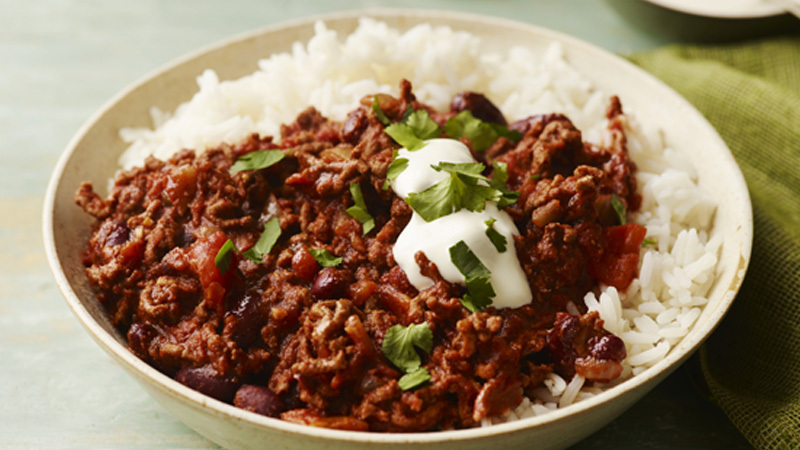 Dark chocolate adds an extra dimension of flavour to a classic spicy chilli! Heat the oil in a large non-stick frying pan over a medium heat and fry the onions for 5 minutes until softened. Transfer to the slow cooker pot. Add the garlic and beef to the frying pan and cook, stirring to break up any lumps, for 2-3 minutes until no longer pink. Stir in the spices and chipotle paste and cook for 1 minute. Transfer to the slow cooker pot and stir in the tomatoes, beans and salsa. Put the lid on the slow cooker and cook on low setting for 5 hours. Stir in the chocolate and season to taste with salt and freshly ground black pepper. Cook for a further 30 minutes. Serve in shallow bowls with boiled long grain rice, topped with soured cream and fresh chopped coriander. Make sure to choose a dark chocolate that has at least 70% cocoa solids as this will complement the spicy flavour of the chilli but not sweeten it too much. Garnish with shredded red chilli for extra colour and heat, if liked.